♥ Expressed Feelings ♥: We went out ! Yesterday we(carolyn,eeli, meifen,kohila, esather n lianee) went out.. We went to the nearest shopping mall, Jusco Cheras Selatan.. Suppose to meet Kohila as she's goin for Matrix in Kedah.. But she got JPA rdy, so she no nd go Kedah.. haha..
and after makan, we talk n take pics..
A+ Teacher = Pn Lim !! 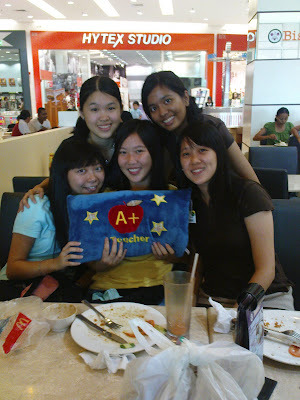 we bought this cutie pillow and a card for her..
Me and Chelseala... long time no see..
After that, we balik rumah !! It's nice to meet them once in awhile.. haha.. we should hv this more often... Amrit ! u must come the nxt time !